There is a long, rugged route through these hills and valleys from Invergarry on the Fort William to Inverness road, far to the east, but it is only attempted by intrepid walkers equipped for camping en route. With good reason, these areas used to be called the "Rough Bounds". Their very remoteness and lack of roads was a prime reason why the region east of Mallaig / Morar / Arisaig was chosen for secret Commando and SOE training during the Second World War. © Copyright Anthony O'Neil and licensed for reuse under this Creative Commons Licence. Someone has complained that the first geograph for this square is not relevent in that it shows a person on the summit of Sgurr na Ciche. Since I submitted the photo I would take issue with this. 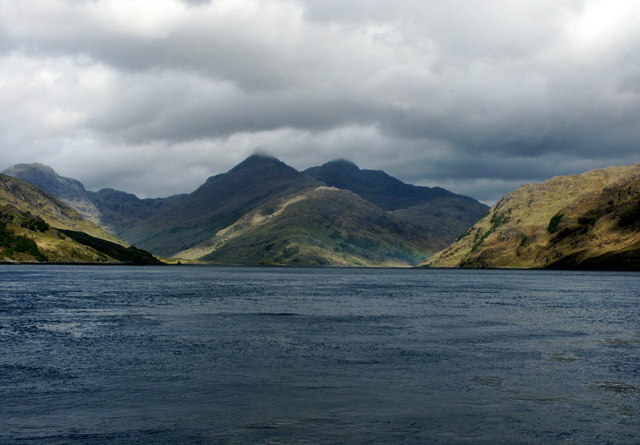 The main feature is surely the view of Loch Nevis from the summit. A picture of a cairn is hardly worthy of a geograph without some other background view. I would suggest that this photo does show a scottish sea loch which is an important geographic feature. One could also argue that the weather ( high pressure) is also important. I would agree that the date on the photo does somewhat spoil the effect and my only excuse for that appearing is that it was a fairly new camera at the time and I had not worked out how to switch the date off ! !